1.3. Improve interface with tabs for insert, edit, and list runs with your template. Go to your Phpmyadmin installation. Select your database name, from the drop down list on the left column in the previous screen. You have to go to the phpmyadmin tab which says "SQL", (versions 2.6.x of Phpmyadmin, like the one in the https://tiki.org/TikiLiveCD, or tab "Import", included in version 2.8.x of Phpmyadmin, for instance). If you had exported your database without the option to delete the tables (Drop tables, from the Backup instructions through Phpmyadmin) before attempting to restore them from the database backup, then you will have to empty the database tables first. (through phpmyadmin, for instance). 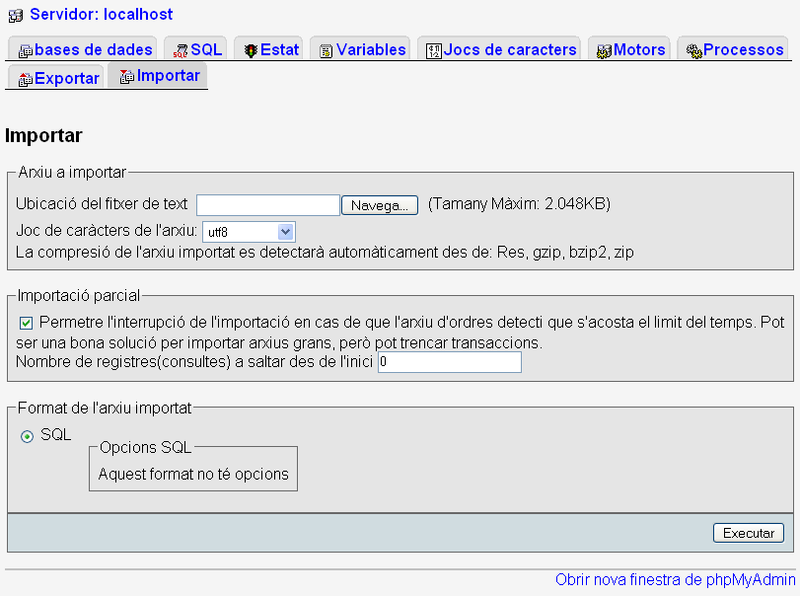 Both tools can import a sql file. See there homepages for details and examples. Two pages are created for the simplest interface. description = Tamaño poblacional. Número entero. description = Tamaño del efecto. Número decimal, normalmente entre 0 y 1,0. Ten en cuenta que el carácter a usar como separador decimal depende del navegador que uses: es la coma (,) con  Chrome y Safari, y el punto (.) con Firefox, Opera, IE9 y afines. description = Nivel de significación. Número decimal, entre 0 y 1,0. Ten en cuenta que el carácter a usar como separador decimal depende del navegador que uses: es la coma (,) con  Chrome y Safari, y el punto (.) con Firefox, Opera, IE9 y afines. Similarly to the interface you can find in the r_test3 page, created by the profile r_test, using PluginTABS and PluginFADE, for instance.